1. Preheat oven to 350 F, 170 C.
2. To make the sponge, whip egg whites in stand mixer with cream of tartar and salt when foamy. Slowly add in 1/2 cup sugar. Whip to stiff peaks. powder. Mix well to combine. Mixture will be thick. Lighten with 1/3 of whipped egg whites. Gently fold in remaining whites. Line jelly roll pan with parchment, spraying well with non-stick spray. Spread batter with offset spatula into even layer. Bake 12-14 minutes or until just done. 4. Let cool 5 minutes, roll up in powdered sugar tea towel and let cool completely. 5. In same stand mixer bowl, whip egg whites for meringues with cream of tartar and salt. Slowly stream in sugar. Whip to stiff peaks, adding vanilla. Place in piping bag with round tip. Pipe mushroom caps and stems onto parchment lined baking sheet. Pat down peaks on mushroom caps with damp fingertip. Reduce oven temperature to 225F (105-110C) letting cool slightly after baking sponge. Bake for 40 minutes. Let cool. Match stems to tops, poking small hole in bottom of caps. Melt chocolate chips in microwave. Dip tip of stem in chocolate and attach to hole in cap. Let dry. 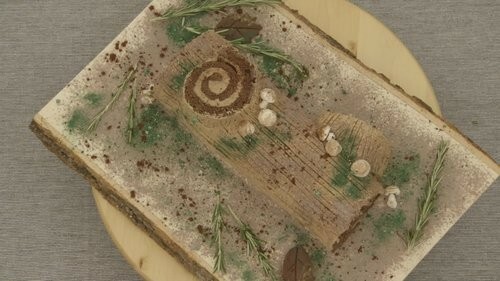 Dust top of mushrooms with cocoa powder to look "dirty". 6. While cake cools and meringues bake, make the filling: in a small bowl, combine the tablespoon cream with the cocoa powder and espresso powder to form a paste. Whip cream and powdered sugar to soft peaks, add cocoa mixture and vanilla. Whip to stiff peaks. Spread on cooled, unrolled cake and reroll. 7. For buttercream: In stand mixer, beat butter until fluffy. Add in powdered sugar, espresso, cocoa, vanilla, cream, and salt. Whip until well combined and fluffy. Taste for sugar level and adjust if needed. 8. Spread in finished log, make texture with tines of fork. Dust with cocoa powder/powdered sugar. 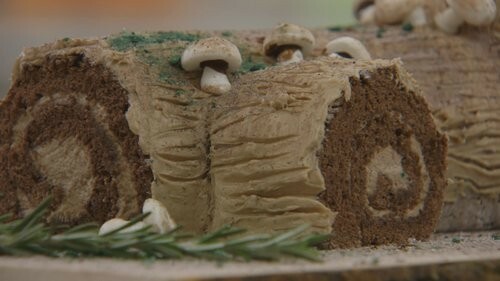 Decorate with mushrooms, Rosemary, currants, and crush remaining meringue in ziptop bag with green pigment to create moss.